Lukla to Tumlingtar Trek connects one of the most common trekking areas of Everest region with the off-beaten trails of Makalu region. Lukla to Tumlingtar Trek is a silent yet interesting trek for travelers seeking a less crowded route. With the outstanding views of Everest (8848m), Makalu (8481m), and other peaks of Mahalangur Himalayan range, walk along the gorge of two high passes, Salpa Bhanjyang (3350m) and Surke La Pass (3085m), to reach the sacred lake of Salpa Pokhari (3460m). Lukla to Tumlingtar Trek gives you an authentic feel of Nepal as you traverse on the quite terrain, vivid with natural and cultural richness. The 12 days Lukla to Tumlingtar trek takes you through both the Sagarmatha National Park and Makalu Barun National Park. 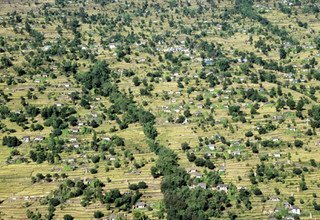 The exploration begins with a picturesque flight from Kathmandu to Lukla, the most thrilling airport in the world. 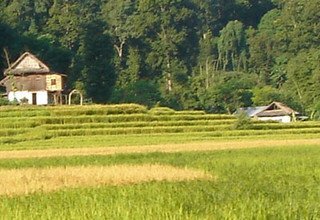 You get to relish attractive sceneries as you walk through culturally rich Sherpa and Rai villages of Paiya, Panggom, Najingdingma, Bung, and Sanam before reaching Salpa Pokhari. Salpa Pokhari is a pilgrimage site for people of different religion and culture, especially the Kirants, who believe that the lake is an equivalent of Ganges River in India. At the altitude of 3350 meters, the highest point of the trek is Salpa Bhanjyang. 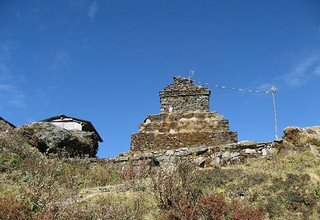 Lukla to Tumlingtar Trek is blessed with an unbelievable richness in nature and culture. Rich aroma of pine trees, tender sound of streams and chirping of birds, along with beautiful views of rhododendron forest, shrubs, and bushes, can be experienced during Lukla to Tumlingtar Trek. At the end of the trek, the trail passes Salpa Phedi to reach Gothe Bazaar. 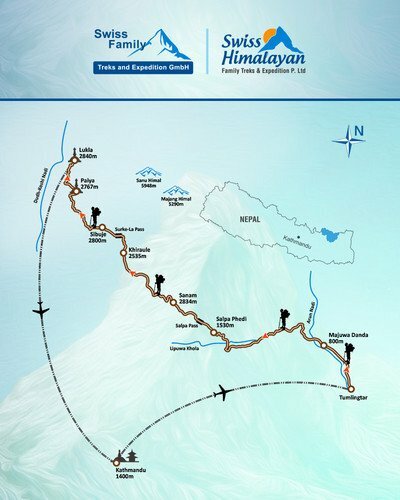 From there onwards, the trail walks down to Tumlingtar to finally take a flight back to Kathmandu. Swiss Family Treks and Expedition offers a wide range of options regarding trekking in the quieter terrain of Nepal. We believe that a tree can be as fun as the guide, accompanying the travelers, lets it be, so we provide you with a friendly guide who is fluent in speaking English. We also provide you with the best accommodation option available in the place. Kindly, note that you should check-in for all the domestic flights at least one hour prior to the flight schedule, and also understand that the flights are subject to delay. Welcome to Nepal! Upon your arrival at Tribhuvan International Airport, you will be welcomed by our representatives who will then take you to hotel. Overnight at 3-star hotel in Kathmandu. You take an early morning flight from Kathmandu to Lukla. The 40 minutes flight serves an amazing view of lush hills and snowcapped peaks. Upon arrival at Tenzing-Hillary Airport in Lukla, you meet rest of the staff members and start the amazing yet short acclimatizing trek to Paiya. 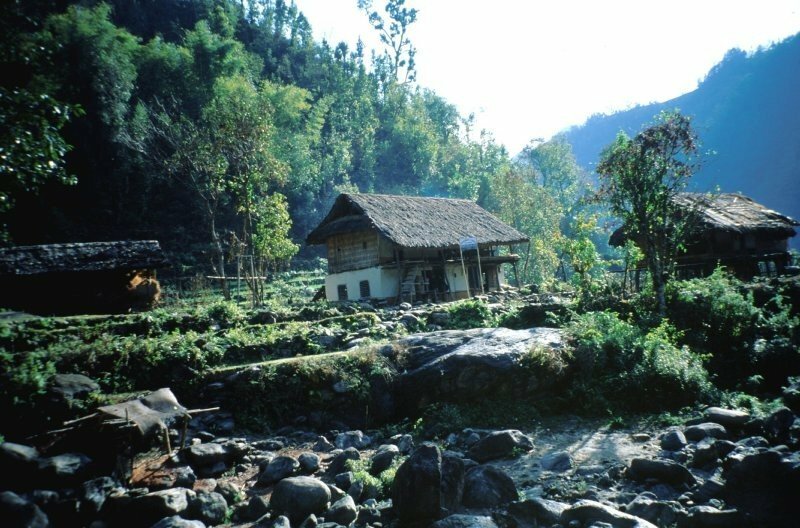 Walking through the alpine forests and crossing several small settlements, you reach Paiya for the overnight stay at lodge. From Paiya Bridge, move towards Kharte to join the trail left that ascends across a slope on a gorge. On the way, you come across a rock marked ‘Arun Valley Trek’ in yellow paint. 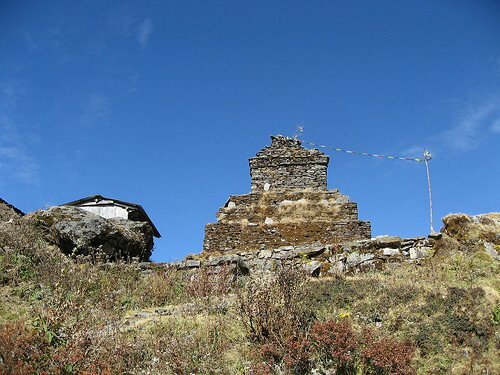 Ascend slowly then arrive at Khari La (3145m) where there is a herder’s stone house. Descend through the forest of oak, birch, and rhododendron, and crossing six ancient Mani walls to reach Pangum. Overnight at lodge in Pangum. Ascend via the village to Pangum La (3173m). 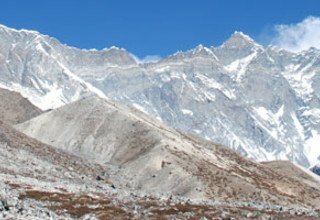 Experience the views of Mera Peak (6470m), of rough forested valleys, and of Najingdingma from distant. Go down through a beautiful old jungle, stretching north to two Sherpa houses. Another 30 minutes leads us to the top of Sibuche (2500m) with lodges and a small gompa. Walk through the bamboo, birch, and rhododendron forest on stone stairs to finally ascend up to Najingdingma (2650m). Overnight at lodge in Najingdingma. Walking through the ridge, climb down into inhabited Hongu valley. It is a relaxed and very exciting day of waking. Walk to reach Bung on the clear path below the gompa and through the blue-roofed school grounds. As the area is highly influenced by Buddhism, we will pass by several Chortens and Mani walls. 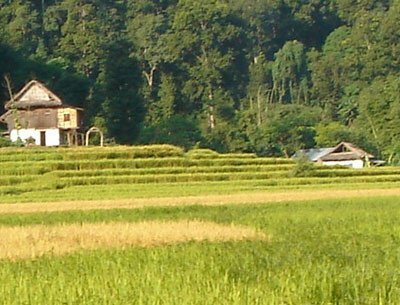 Bung is filled with Rai culture, a group of concentrated smallholdings covering the hillside from 1900m down to the Hongu Khola Bridge at 1320m. Overnight at lodge in Bung. Walk past the large rock imprinted with Buddhist mantras, and pass a school, a waterfall and covered bridge. Walk along the lush forest of rhododendron, chir pine, and brown oak for the final climb to Sanam (2850m), where you will find a single series of Sherpa homes dominated by a new gompa. 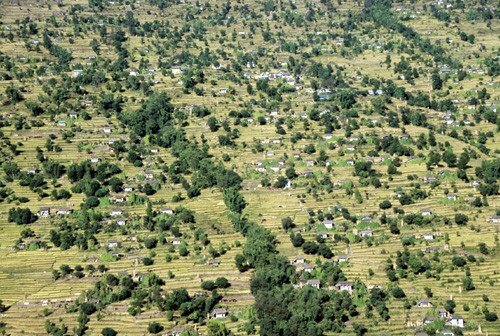 There are widespread potato fields and many livestock in the area. Overnight at lodge in Sanam. Continue to ascend via a delightful forest to Salpa Bhanjyang (3350m), the highest place of the trek. From the top, you will have an amazing view of the holy lake of Salpa Pokhari. Then, go downhill into the warmer climate of the Irkhuwa Valley. 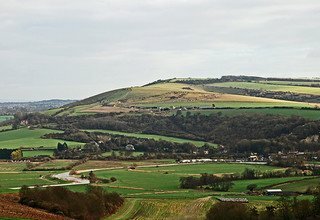 It is beautiful to see the landscape change as you get higher. Walk by the lovely Mani walls along with an amazing view the Himalayas including Mt Kanchenjunga (8586m), Makalu (8481m), Mera Peak (6470m), and Everest (8848m) among others to arrive in Phedi. Overnight at lodge in Phedi. Leaving Phedi, cross the river on stones and hike a little over a ridge, cross the bamboo bridge, and ascend over the small forested ridge to finally descend to Dobhane. 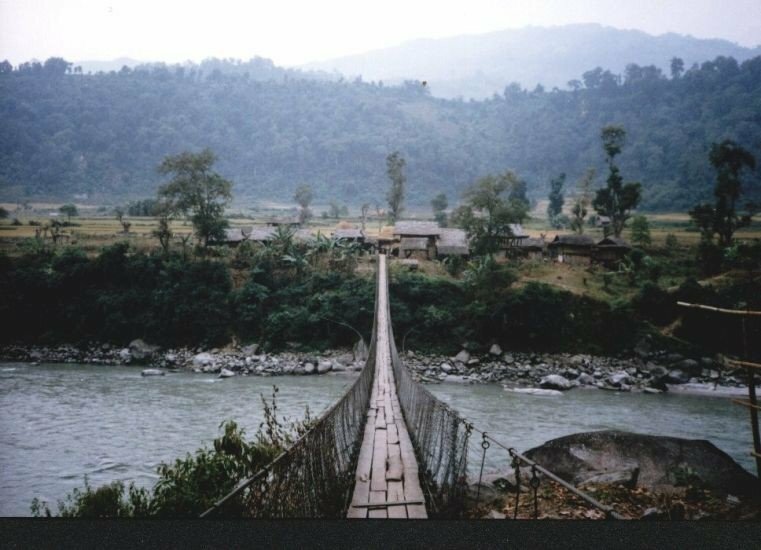 Crossing more bridges over Benkhuwa Khola, you walk through rice paddies and water channels, scattered with dry rocky ridges, to reach the attractive Ghote Bazaar (775m) for an overnight stay at lodge. 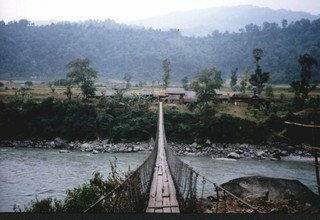 Make an easy walk following Irkhuwa Khola to join Arun River. The only real problem will be the overpassing of a large spur, which may present difficulties to find the route. Finally, cross Arun River and continue on an easy downhill slope. After walking further, you finally reach Chyawabesi. Overnight at lodge in Chyawabesi. Leaving behind Chyawabesi, you continue walking until you reach Bheteni which has a row of shops. Pass the river and track since the road now bends up to Khandbari, and enjoy hiking beside the river. Cross a large suspension bridge and another settlement, and ascend uphill on the trail to the left. Ascend up to two stages to the broad highland between Arun River and Sabha Khola, and move along on a dusty road to reach Tumlingtar (460m). Overnight at lodge in Tumlingtar. A scenic flight over the hills and the mountains of eastern Nepal takes you to Kathmandu from Tumlingtar. Upon arrival in Kathmandu, you can either rest or go on for souvenir shopping or food hunting in the vibrant markets of Kathmandu. Overnight at a 3-star hotel in Kathmandu. After your breakfast in hotel, our staff will drop you at the airport for your scheduled flight back home. Farewell, and we hope to see you again. * 2 nights accommodation with breakfast at 3* hotel in Kathmandu. * Flight ticket from KTM/Lukla and Tumlingtar/KTM and domestic airport tax. * 1 experienced, helpful and friendly guide, porters (1 porter for 2 persons), their food & accommodation, busticket, salary, equipments and insurance. * Makalu National Park Permit and all necessary permits.